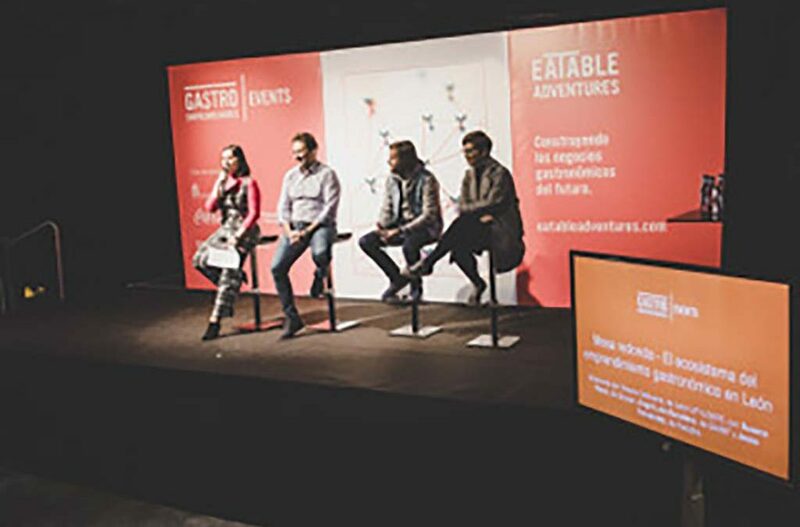 The latest edition of Gastroemprendedores, initiative launched by the Spanish food accelerator Eatable Adventures, was held on the 15th of October in León, framed within the 2018 Spanish Capital of Gastronomy. The event focused on presenting the opportunities offered by the gastronomy sector in Northwest Spain in general, and León in particular, involving renowned speakers, many of whom have a local connection with León. As proof of the success of the theme and format, the event enjoyed a great attendance, with over 380 participants coming from León and bordering provinces in Northwest Spain. The opening of the event was conducted by Antonio Silván, mayor of León’s council. Afterwards, José Luis Cabañero, CEO of Eatable Adventures, presented a report including the sector’s most significant data, gastronomy opportunities and trends in present-day Spanish gastronomy, as well as the keys to success they regard as essential for any new project undertaken in this field. Marcos Morán, from Casa Gerardo, who shared with the audience the importance of failing to learn, of appreciating all types of knowledge and being able of taking advantage of the specific knowhow involved in each business. Jesús Sánchez, from Cenador de Amós, who offered his view on how the use of tools such as the enneagram enabled to define customer profiles in order to be able to provide personalised experiences in catering businesses. Juanjo Pérez, from Cocinandos, who shared his interpretation of what innovation is and is not in cuisine and catering, enriched with his personal experiences and success stories in his restaurant, and presented is latest innovation project in León, which has an important social approach. Next, the event revolved around unique, innovative business models within the gastronomy sector, relying on two speakers from León. Nacho Aparicio, from Mamá Campo, told the audience how a project to distribute ecological products to small supermarkets started, and how different opportunities emerged along the way, changing the company’s objective and transforming the initial idea towards restaurants in Madrid and alternative market channels for his dishes, such as catering, delivery or physical presence in the terminals of several national airports. For Aparicio, “being flexible enough in a project that is undertaken as to abandon the initial idea, but respecting the company’s values, as well as brand, brand, brand” have been the key to success of Mamá Campo. Álvaro Cuesta, from Food in the Box, shared with the audience how his idea came up, bringing together technology and passion for cuisine in order to fix the consumer’s lack of nutritional culture and prevent health problems linked to inadequate diets, while reducing the amount of food waste in the households. The result is Food in the Box, which provide different healthy dishes directly delivered to the consumer’s home, using restaurant-style recipes with the aim of being able to cook quick dinners at home all through the week. For them, nutrition will be personalised in the future, but avoiding routine and boring food. For Cuesta, the greatest mistake when starting a business is confusing a business idea and a business model. Omnichanneling strategies for distribution and partnering with other food brands have meant for Food in the Box a final boost to its project. After Nacho and Álvaro’s talks, there was a discussion panel focused on León’s entrepreneurial ecosystem. The discussion was moderated by our expert technician Victoria Valbuena, perfectly accompanied by Susana López from Qooqer, Ángel Escudero from 987 Ginand Jesús Fernández from Kadabra Beer. During their relaxed talk, these three entrepreneurs from León explained to the audience why they opted for starting up a gastronomy project when their career had been developed in other fields, what mistakes they made along the way, what things they would change if they could go back in time, what challenges and advantages are involved when starting up a project in a city like León, etc. And they concluded by offering the listeners their particular tips on starting up a business: Susana López recommended “being clear about the value proposal, that which make you different from the rest, and defend that value proposal above all else.” Ángel Escudero advised “to defend at all costs your initial business idea, and not to let everybody else’s opinions deviate you from the set goals.” Finally, Jesús Fernández added that in order to start up a business it is necessary to rely on “training, training and training, followed by capital and funding search.” All this provided that you are well advised by experts, and surrounded by a great team of professionals, a statement accepted by the three participants in the discussion panel. The event concluded with a presentation by Sergio Estévez, mixologist and brand ambassador of the Cocacola group brands, who talked about mixed drinks 3.0 as the new evolution of mixed drinks. After the event closed, the attendees could talk face-to-face with all the speakers in this edition of Gastroemprendedores during the subsequent networking session. Gastroemprendedores Northwest Edition has been a high level event, to which a great number of people from León has responded positively, and we hope this will be just the first of many events that can highlight all the advantages and opportunities our city offers for the gastronomy and food sector.